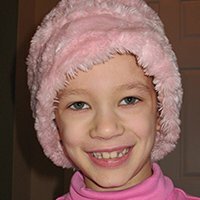 Allison was six years old in April 2007 when she was diagnosed with a medulloblastoma. The surgery successfully removed the whole tumor, about the size of a plumb. She then underwent six weeks of radiation, and nine rounds of chemotherapy at Children’s Hospital, under the care of Dr. Nick Foreman and his wonderful staff and the nurses in the infusion room. She completed therapy in May 2008 with the support of a wide circle of family and friends. Allison is a quiet but expressive girl who enjoys reading and writing. Now that her treatment is over, she is returning with full force to school, her Junior Girl Scout troop, playing with her sister, Emily, and her dog Coco. She baked and sold homemade dog biscuits to raise money for a child going through treatments at Children’s to get a dog during therapy because her dog has been such a joy and source of comfort. The dog will come from the K-9 Companion program through the Colorado prison system. During her treatment in second grade, Allison wrote and illustrated a story book called “The Day I Found Out I Had Cancer”. She says that writing her story made her feel better and she wants other kids to feel better too.